This is a tutorial page designed to answer the thousands of questions we get about 5m LED strip rolls. All strips come standard as a 5m roll. We mainly sell in 5m rolls, because we have over 100 types and don't really want to have 1000 offcuts. It can be done, but you will pay a premium. 1. '3528' - older chip, up to 6 Lumens per chip. 2. '5050' - newer chip, up to 17 Lumens per chip. 5050 chips are in effect 3 x 3528 chips in one. Strips are either bare (non-waterproof), with chips on the surface, or the bare strip is covered in a clear resin (waterproof). There are advantages & disadvantages for each. 'non' strips disperse heat better, are lighter, do not illuminate the strip itself. They are more fragile (chips can be knocked off) and harder to clean (lots of nooks & crannies for dirt to hide). 'waterproof' strips get a bit warm, are less likely to get damaged, heavier, easy to clean and illuminates the resin somewhat. Waterproof strips will have a shorter life (and warranty) due to the added thermal constraints. To determine the brightness of a strip (say 60/m 5050 white), multiply the chip rate (60) by the length (5) by the Lumen rating (17 for 5050) by the color factor (100% or 1) which gives: 60 x 5 x 17 x 1 = 5100 Lumens. Current draw is manufacturers rating. Actual current draw is often lower depending on room temperature and other factors. Strips can be cut shorter but LEDs always work in sets of 3. This type of strip can easily be joined, extended and cut into multiple working pieces. Colors (in order of popularity): white - warm white - blue - red - green - amber - pink - purple. Less popular colors are more expensive and harder to source. The wire attached is fairly short, it can be lengthened by soldering a new wire on to the strip. There is no plug attached but we do sell them separate for $4. It is required when connecting to a power supply. Every strip has 3M brand high quality double sided tape on the back. It is important that the surface applied to is VERY clean. 1. Thin circuit board. 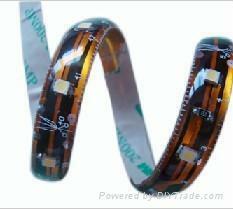 If the circuit board is paper thin, the LEDs will overheat and die quickly. It also means on a longer run, the current going through the circuit board is too much for the small amount of copper, creating heat. So instead of taking heat away from the LEDs, the circuit board is adding heat. 2. Chinese LEDs. Standards (and prices) for Chinese LEDs are significantly lower than those from Taiwan / Japan / Korea (strip assembled in China) LEDs. Chinese LEDs have lower efficiency, lower light output, colour shift and a much shorter life. 3. Some "5050" cheap LEDs are only pretending to be a 5050. In fact they are a 3528 inside a 5050 shell. 4. Over-driven LEDs. Having lower light output, factories will sometimes use smaller resistors to make the low grade LEDs brighter. This causes the LEDs to overheat.